Join the director (Andy Kirtland) and cast members of Prime Stage Theatre's fado-flavored production of Twelfth Night. Match wits with one of Shakespeare’s most dynamic heroines in this hilarious tale of love, music and courage. Set in the colorful world of Portugal, Twelfth Night tickles the imagination as Viola disguises herself as a page boy to find her twin brother but finds herself at the center of a crazy love triangle. If music be the food of love, play on! Come to The Library Public House at 6PM to enjoy dinner and drinks with fellow Britsburgh Arts lovers. At 7pm, the entertainment will begin including scene readings with Carolyn Jerz (Viola) and Alison Weisgall (Olivia). Also Monica Stephenson (composer) will speak about the music she has composed for the piece, and Dana Babal (Feste) will play a song. There will be Q&A and the director, Andy Kirtland will talk about his inspiration for the play. Stick around afterwards to enjoy social time with fellow Britsburghers. MEMBERS LOGIN FOR FREE REGISTRATION. To become a member, visit the Britsburgh membership page. 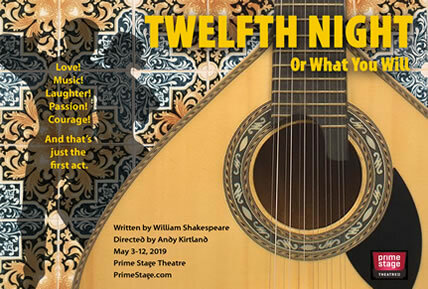 Britsburgh members get 40% off tickets ($10 off an adult ticket) to the Twelfth Night performances in May! Are you ready for a St. Georges's Day Britsburgh Arts Society sandwich? April 23rd is not only St. George's day but also is William Shakespeare's 455th birthday. Join us for An Evening with Twelfth Night on Monday and with the Mendelssohn Choir of Pittsburgh on Wednesday! What a great week! Prime Stage Theatre's Twelfth Night forms part of this year's Week of Will put together by Britsburgh partner Pittsburgh Shakespeare in the Parks. Twelfth Night runs from May 3rd – 12th. For tickets to the show visit Prime Stage Theatre's website. 6-7PM - Dine, meet and greet. 8PM onwards - Relax and spend some time afterwards with fellow Britsburghers and make plans to see the show! Explore fascinating British-themed topics with the guidance of experts and enjoy the company and conversation of fellow enthusiasts as a member of one of Britsburgh Societies: Britsburgh Arts Society, the Britsburgh Beer Society, the Britsburgh History Society, the Britsburgh Literary Society and the Britsburgh Tea Society. If you are not already a member, we would like to invite you to consider becoming a Britsburgh Society member.